What's New Archive - July 1 - Batter Up! July 1 - Batter Up! July 1 (Tuesday, 7:15 p.m.) Batter Up! 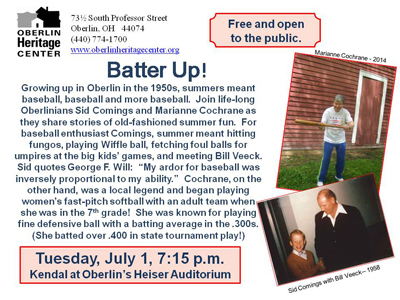 Growing up in Oberlin in the 1950s, summers meant baseball, baseball and more baseball. Join life-long Oberlinians Sid Comings and Marianne Cochrane as they share stories of old-fashioned summer fun. For baseball enthusiast Sid Comings, summer meant hitting fungos, playing Wiffle ball, repairing broken bats, treating his baseball glove with Neatsfoot Oil, memorizing baseball statistics gleaned from Sporting News, fetching foul balls for umpires at the big kids' games, and meeting Bill Veeck. Sid quotes George F. Will: "My ardor for baseball was inversely proportional to my ability." Marianne Cochrane, on the other hand, was a local legend and began playing women's fast pitch softball with an adult team when she was in the 7th grade! Location: Kendal at Oberlin's Heiser Auditorium. Press Release - Batter Up!